These little things are full of horrible toxins. Just to touch one will cause a nasty rash at the very least and anaphylactic shock at the very worst. I am so glad we cleared the horse’s paddock of any nests. And then Tuesday went south – I lost my car key. I have dreaded doing this for two and a half years now. I’m usually super-careful about arriving at the farm, going straight into the tack room and putting all my keys on a shelf. This time, I was distracted. I arrived just as Alexandrine came down from the top paddocks on the quad. We said our ‘Good Mornings’ and she offered me a ride down to Flurry and Aero’s paddock. Who am I to turn down a spin on a quad… The result was that I forgot to put my key away. I can only assume that it fell out of my pocket somewhere between the stables, the horses’ paddock, and the arena. It’s even possible that it was stuffed into a hay net and soaked. If this is the case, I will find it in one of the feeders today. Fingers crossed – because I’ve searched the route from stables to paddock to arena several times and combed the arena three times – and combing a 60×30 arena is not a trivial task. Thankfully, I have a spare. Even more thankfully, the LSH was able to find it. Eventually. And then Tuesday picked up again. I submitted an article to Horse Junkies United a couple of weeks ago and GUESS WHAT? I found out it got published! Woohoo! I’m embarrassed to say it got published on Sunday and I didn’t notice it. Whoops. I blame Facebook’s Edgeranking system. And Twitter’s clogged up newsfeed. You can read it here : Introducing Equifeel. 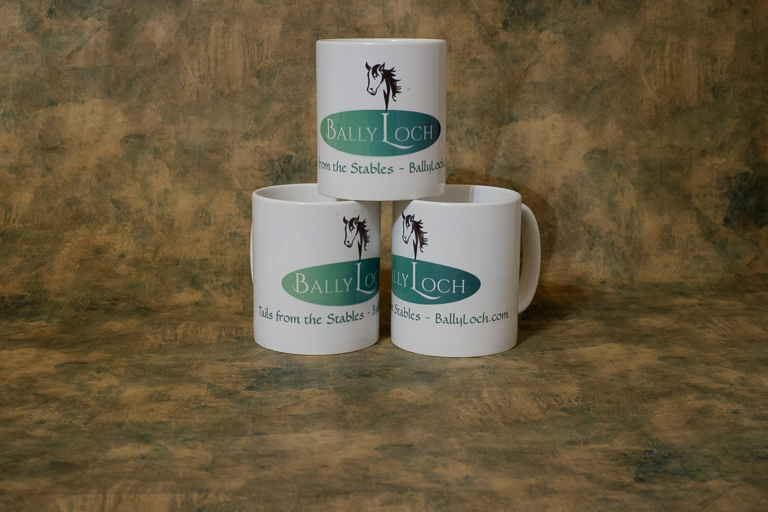 The Ballyloch Mug Giveaway has another two days to run. If you want to be sipping your tea from one of these beauties, you can enter via the blog here, via Twitter @MaGreenlee and via Facebook at Tails From Provence. There is one mug up for grabs from each – in theory one person could win all three (and I hope you do, Rodney’s Saga!). Oh yes, and the second Ballyloch story, Healing Charlie, is out tomorrow. Congratulations on the article being published. Lost keys–ugh! Glad your day turned around. 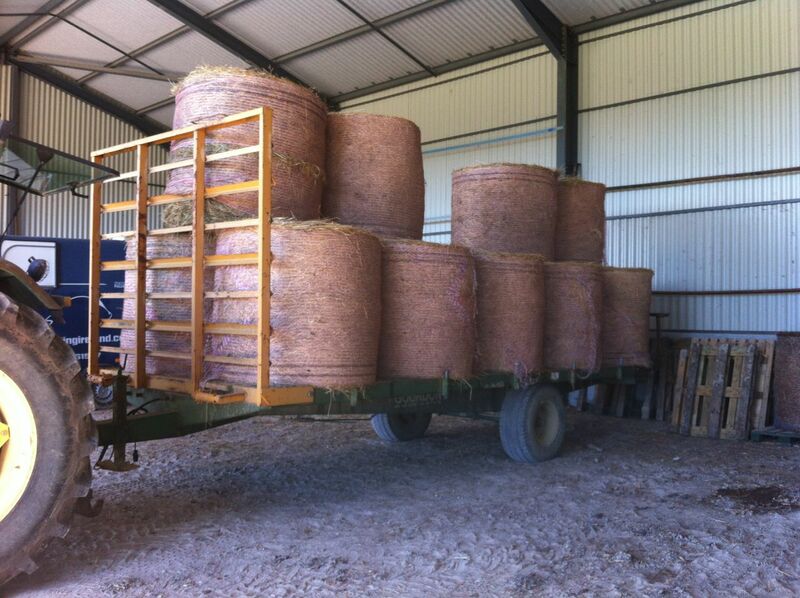 We Yanks are turning to these giant ‘rolls’ of hay more and more. They were originally designed to be fed to range cattle…take a roll out onto the range, unroll it (there’s a special rack installed on the back of a flatbed truck that allows it to feed out) and the cattle all line up. But the concept proved too alluring for horse folk to dismiss. These days the growers go one step further..it’s called ‘haylage’ (derived from ‘silage’). They roll up the freshly cut hay in ugly white plastic wrap and let it ‘ferment’. Once the oxygen’s been consumed in the bale, the hay cures rather than ferments. You don’t have to worry about barn fires. The problem though, is that a lot of horse (and small cattle operations) don’t have enough animals to eat the whole roll before it rots in the rain. If you keep the hay covered (like under a roof) once it’s unwrapped it doesn’t rot. Good on your LSH for finding your key. We used all big bale haylage in Ireland. Haylage is a better fodder than hay for the Irish climate, given that it typically is baled a day earlier. The French have not adopted it with the same enthusiasm as the Irish though. Unfortunately, or I would not have had the coughing issues with Aero. Fingers crossed that Incomprehensible Michel’s stuff is sufficiently dust free for him. How interesting that the round bales got unrolled. In the UK they’re plopped whole into a metal ring feeder and everyone gathers round it. I tell ya, it’s great to see hay delivered and not be the person organising it all!! The joys of being a livery instead of being the boss! And thanks for the HJU comment, I hope people like it, it’s pretty different to their normal stuff.